WASHINGTON • Republican presidential hopeful Ted Cruz split victories in four nominating contests with front runner Donald Trump, bolstering Mr Cruz's argument that he represents the best chance to stop the New York billionaire. The results were a repudiation of a Republican establishment that has bristled at the prospect of either Mr Cruz or Mr Trump winning the party's nomination and has largely lined up behind US Senator Marco Rubio of Florida, who was shut out in all four contests. "I think it is time that he dropped out of the race," Mr Trump said of Mr Rubio after the contests. "I want Ted one on one." Mr Cruz won Kansas and Maine on Saturday, while Mr Trump won the bigger states of Louisiana and Kentucky, holding on to his lead in the race for the Republican nomination for the Nov 8 presidential election, even though Mr Cruz captured more delegates on Saturday. The next big contest, and a crucial one, will be tomorrow's primary in the industrial state of Michigan. Republicans in three other states, Mississippi, Idaho and Hawaii, also will vote tomorrow. The scream you hear, the howl that comes from Washington, DC, is utter terror at what 'We the People' are doing together. TEXAS SENATOR TED CRUZ , speaking to supporters in Coeur d'Alene, Idaho, after his early win in Kansas. It looks like it will be the angry Trump voters against the purist conservative Cruz voters. The establishment is just being left out. MR RON BONJEAN, a Washington- based Republican strategist. We have got the momentum, the energy and the excitement that will take us all the way to the Democratic National Convention in Philadelphia. DEMOCRATIC CONTENDER BERNIE SANDERS in a statement, despite his trailing rival Hillary Clinton. Mainstream Republicans have blanched at Mr Trump's calls to build a wall on the border with Mexico, round up and deport 11 million undocumented immigrants and temporarily bar all Muslims from entering the United States. But the Republican establishment has not been much happier with Mr Cruz, who has alienated many party leaders in Washington. A spokesman for Mr Rubio, who spent the past week launching harsh personal attacks on Mr Trump, said the senator would push on with an eye on the March 15 contest in Florida. Mr Cruz, a first-term US senator from Texas who has promoted himself as more of a true conservative than Mr Trump, said the results showed he was gaining momentum. Boasting of his "breadth of support", Mr Cruz suggested it was time for Mr Rubio and Ohio Governor John Kasich to consider dropping out of the race. "We will continue to amass delegates, but what needs to happen is the field needs to continue to narrow," he said. "As long as the field remains divided, it gives Donald an advantage." Mr Cruz, 45, has run as an outsider bent on shaking up the Republican establishment in Washington. A favourite of evangelicals, he has called for the US to "carpet bomb" the Islamic State in Iraq and Syria militant group and has pledged to eliminate the tax-collecting Internal Revenue Service and four Cabinet agencies, and to enact a balanced Budget amendment. "The scream you hear, the howl that comes from Washington, DC, is utter terror at what 'We the People' are doing together," Mr Cruz told supporters in Coeur d'Alene, Idaho, after his early win in Kansas. Mr Trump, 69, has a substantial lead in the delegates needed to secure the nomination at the Republican National Convention mid-year. 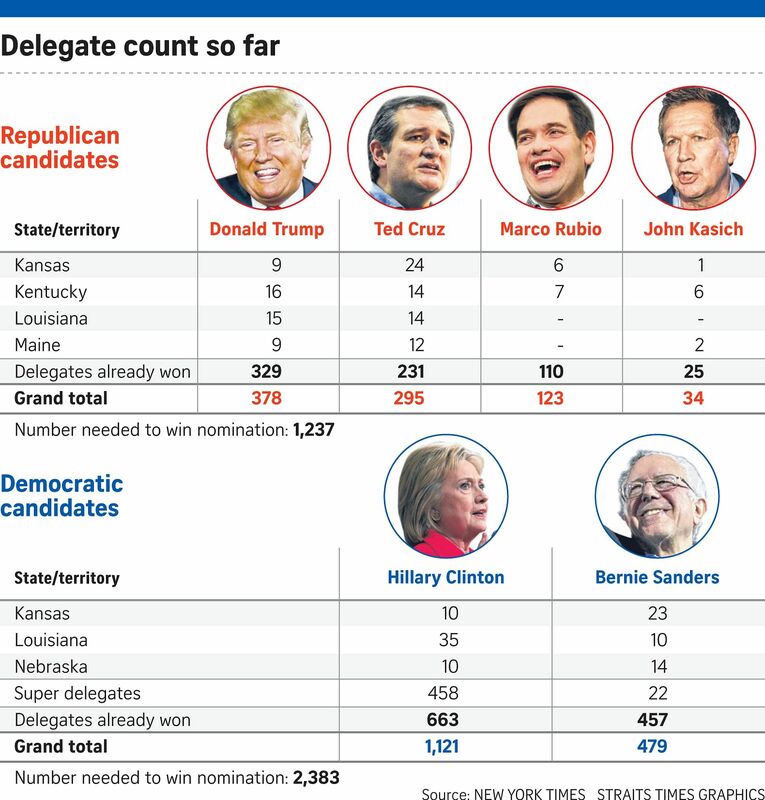 The four Republican contests on Saturday together accounted for just 155 delegates. Mr Cruz won 64 delegates on Saturday, while Mr Trump took 49. On March 15, the delegate-rich states of Florida, Illinois, Ohio, Missouri and North Carolina will vote. If Mr Trump takes both Florida and Ohio, he would be nearly impossible to stop. There are a total of 358 delegates at stake in the five states voting on March 15, including 99 in Florida and 66 in Ohio.